* When you fail to meet a Perk's requirements, another copy of the Perk Injector will be automatically added to your inventory. The Perk Injector will no longer be wasted if you use it when not meeting the requirements. * Fixed a bug with the Fast Metabolism trait wherein it would conflict with the final rank of the Medic perk. * Fixed a bug with the Fast Metabolism trait wherein entry point priorities were set incorrectly. * Fixed a bug wherein the Big Game Hunter perk was unobtainable for players with the Adrenaline Junkie perk (the script was checking the wrong perk, if you're curious). 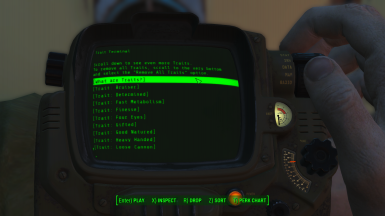 * Fixed a bug wherein the Sanctuary space in the Wasteland was erroneously flagged as edited, causing mod conflicts. 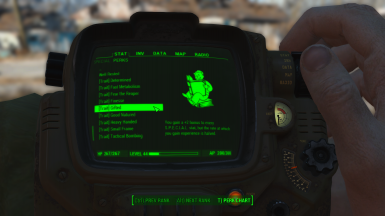 * Fixed a bug with the Determined trait wherein Stimpaks would not heal crippled limbs in Survival Mode. Now, in Survival Mode, Stimpaks still won't heal you if you have the Determined trait, but they WILL restore crippled limbs. 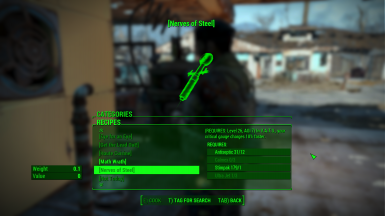 can you make it so you have the option to use a level up for the perk chart for a trait so it is more balanced. Can you maybe make it so you can see what traits are currently active somewhere? 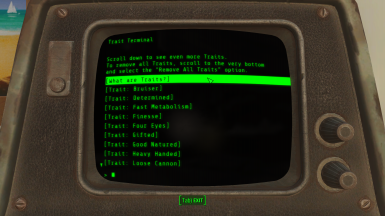 Edit: Nevermind, found out the mod was just broken and not adding the traits despite the message saying it was. Fixed it and now they appear in perk tab. I got the different start mod and since then have been doing a playthrough where I'm just rping as a self aware runaway synth, so the idea that I can use injectors to add character features is just perfect! 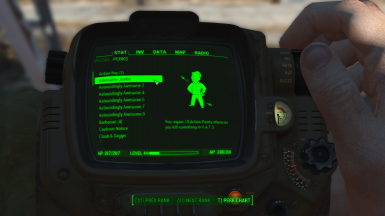 If this mod has not been orphaned, please add a visual and sound effect when a crafted perk injector is used. A grunt of pain and momentary blurred vision would be a nice confirmation that a life-altering chemical has been ingested. not sure why but my game won't launch without your mod and it's conflicting with the start me up the mod, any info on how to fix this or a patch I could download would be great thanks. 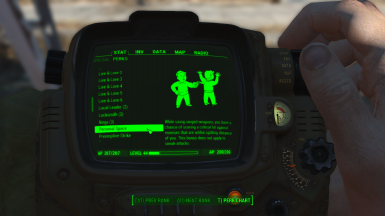 I would just like to bring this mod to your attention, it adds a level up menu similar to fallout 3 and fallout new vegas. You could likely add your perks using the framework and tutorials provided on the mod page. Not actually sure how easy or hard it is to learn, or how easy or hard it would be to switch systems for learning perks, but thought it would be good to mention it. I'm still expecting, that Cirosan suddenly appears out of nowhere with the new version of this mod which fully benefits from using Neanka's LevelUpMenu since there still is no better Trait mod available. Hope dies last. Does the better criticals perk affect the damage of the criticals that the Finesse trait adds? Ive been thinking it would be cool if you teamed up with IAMKRYPTIC https://www.nexusmods.com/fallout4/users/5257736 and dree74 https://www.nexusmods.com/newvegas/users/473332 (or at least got some permission from him to use similar perks and traits from his more perks mod like art of pain, sense of emergency and too drunk to die). Just letting you, the MOD AUTHOR, know that your mod contains EXACT ITMs as the main files. It can and is causing a conflict in my game, personally. Using Wrye Bash, I can't "clean" it unless I use FVEdit and I'm not trying to get into doing that right this minute. You may want to use Wrye Bash yourself and test your mod for conflicts, which there is 1 major one happening. Dude i think old fallout and FNv fans will miss off from this forum, because this is a simple action game than that perk system. It is terrible by Beth . and yet you're clearly playing it. Not really a point, since he is in a "feature taken away by a hack developer" section of the nexus. 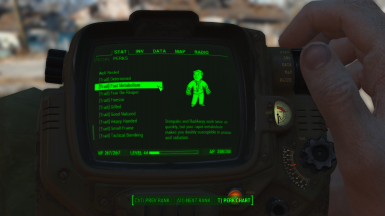 Yeah we're playing it under the condition we can fix bethesda's biggest f*** up to date. 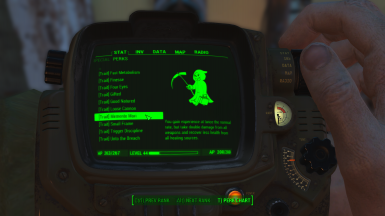 If this mod (and the full dialogue interface) didn't exist then you can bet i wouldn't be playing fallout 4 right now. Is this compatible with Start Me Up? 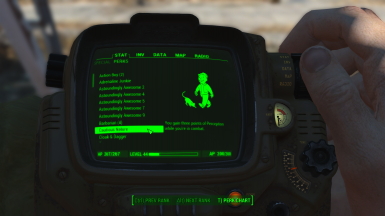 http://www.nexusmods.com/fallout4/mods/18946/? If not, can a patch be made?